My big brother got a scanner for Christmas from his wife. And he's been entertaining me with photos of my past - from about 1982 and 1983, when I was 16 or 17. Here are just two. 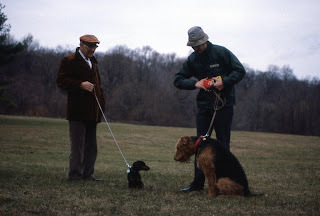 The top one - is of my Grandfather with his dog, Lucky and my Dad, with our dog Montgomery. We had a lot of fun with those dogs. 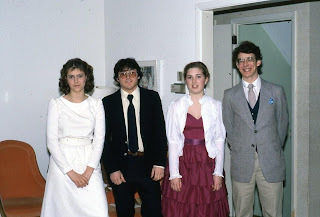 And the bottom is a high school dance. My best friend (still is, and my oldest, I've known her since I was 9! ), Chantal and I were invited to attend the prom at Christian Brothers Academy. I still remember the gold strappy shoes, my first "grown-up" shoes. My friends in college always were amazed that I'd arrived with out having ever kissed a boy. As you can see, my young virtue was pretty safe with these guys!